When I look around the natural world I am endlessly inspired. 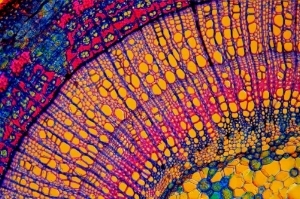 Recently I stumbled across microscopy - which is basically cell imaging. This slide of a slice from a two year old stem from a Dutchman's Pipe vine, Aristolochia sp. dazzled me. So my first Limited Edition series is inspired by this amazing photo. Many thanks to Ralph Grimm, the photomicrographer from Jimboomba, Australia, who took the shot. The following Goddesses are the result.